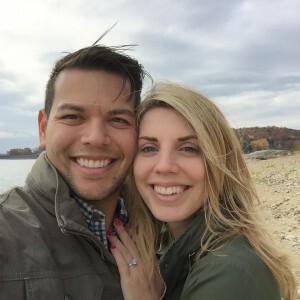 An engagement ring is one of the most important purchases a couple will make—and often one of the first when they begin their journey as husband and wife. 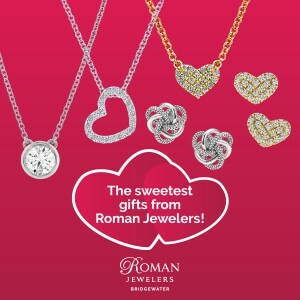 Roman Jewelers understands this better than anyone and has worked for 30 years to simplify the process by providing education and guidance from our qualified sales team, competitive pricing and financing and the large selection of diamonds and ring settings, you’ll see in Central New Jersey. 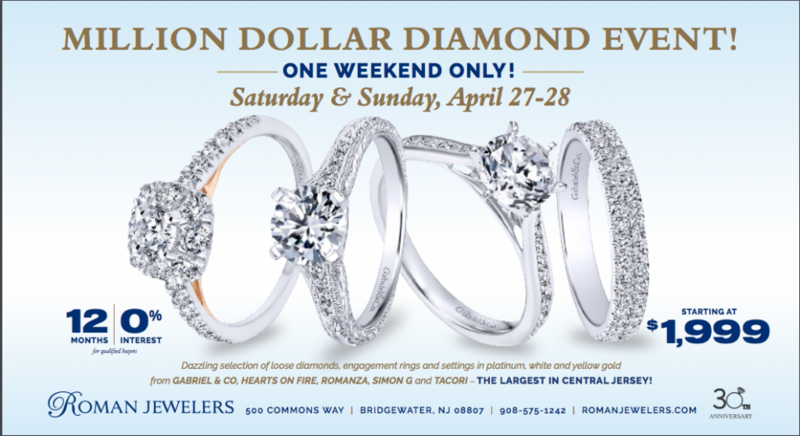 April 27th and 28th, Roman Jewelers will also be hosting it’s MILLION DOLLAR DIAMOND EVENT. Here, you will have the opportunity to view additional merchandise since our store will be partnering with our trusted suppliers to bring in EVEN MORE than what is normal in our showcases. We will have some engagement rings settings starting as low as $1,999—but we will also have larger diamonds—over 2 carats—for those who choose. Special pricing and financing will be available. Because choosing a diamond requires the most consideration, our staff will gladly walk you through ”the 4 C’s“: cut, color, clarity, and carat weight—if you need a refresher. It’s important to also know that two diamonds graded equally along the 4 C’s are not necessarily equal—the unique properties of a diamond can look very different and are a personal choice. A diamond truly must be seen. Beyond the 4 C’s, you must consider what shape of diamond you’d like to choose. 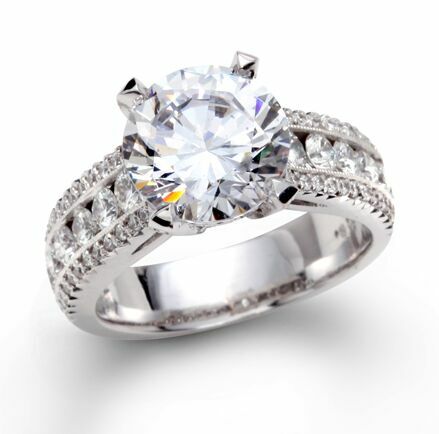 Rounds are classic, but Ovals are quite popular lately and offer a larger look that compliments some ladies very well. There are also princess, pear, emerald shapes, as well as many others. 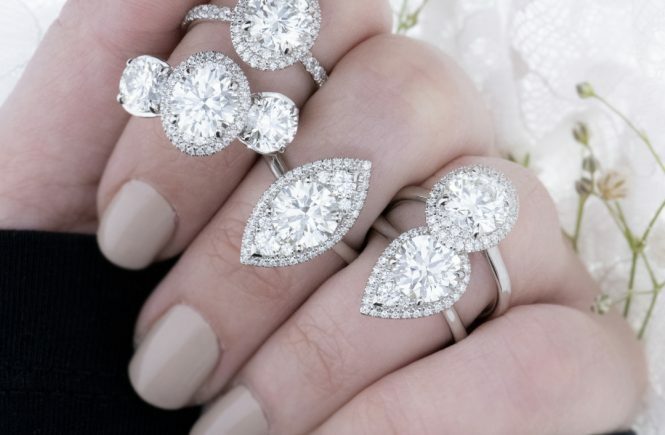 It is important to choose a diamond shape that not only reflects the style of the wearer, but also complements the ring’s setting and the wearer’s hand. Beyond the diamond, you must choose a type of precious metal for the setting of the engagement ring. There are many options when it comes to precious metals, and they come in a variety of different colors and prices. The preference of the wearer and price of the precious metal are of importance in this selection. However, one should also consider choosing a metal that matches the skin tone of the wearer. During the Roman Jewelers Event, there will be hundreds of rings to choose from. You’ll find the perfect one. The type of setting, which is the method by which an engagement ring’s diamond is secured in the ring, is another component to consider when choosing an engagement ring. The most common type of ring setting is a prong setting in which a small, claw-like prongs grip the diamond to hold it in place. Other setting types include bezel, tension, pavé, halo, flush, and many others, each with its own unique look and attributes. Layering has always been a fashionable trend and it is no longer limited to clothes! Layered jewelry looks are already very popular, and stackable rings has become the latest fun and simple trend that can complete and compliment any gal. 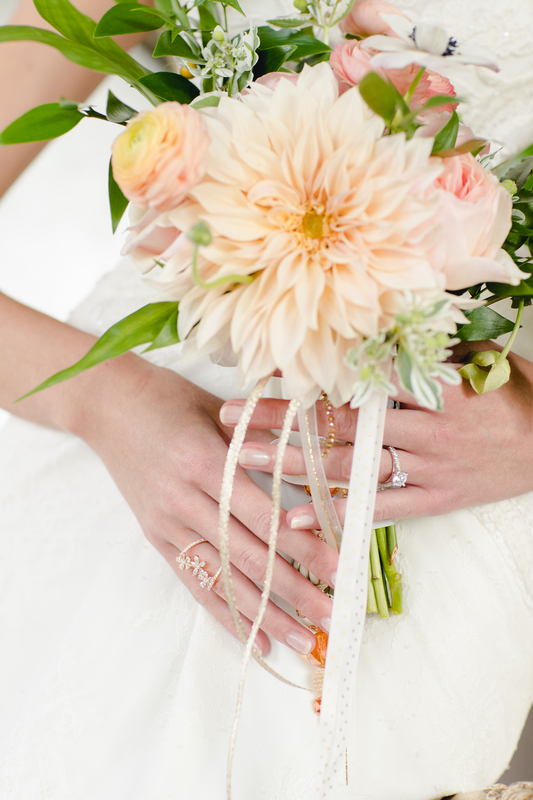 Here are some suggestions for wearing stackable rings. Jewelry is meant to be enjoyed and loved! That’s why so many of us wear our jewelry every day. When you love your jewelry this much, it is much more is subject to wear and tear, and every time you bump, rub or scratch your jewelry you may be causing some harm. This happens mostly with rings…especially engagement rings. Roman Jewelers had a successful and fun Holiday Season and we were thrilled to see a lot of familiar faces in our store as well as some new ones. We enjoyed the romance of the season—meeting our #RomanJewelersRomantic couples, who were celebrating with wedding news and proposals. 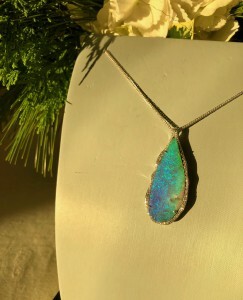 There were also some “top jewelry trends” of the Season that we wanted to share with our friends. Simon G. Defines Holiday Sparkle & Extended Hours, too! “Simon G is our customer’s favorite designer,” is something we say this every year around the holidays, and this year’s Simon G. Show confirmed in once again! At our most successful show yet, we asked customers why they love Simon G…the answers are not surprising–they are the same reasons our staff and jewelers all over the world love the line–Quality, Price Point and Design. If you missed the show, do not fret…our collection of Simon G. Jewelry is extensive and there is still time to find the perfect gift. 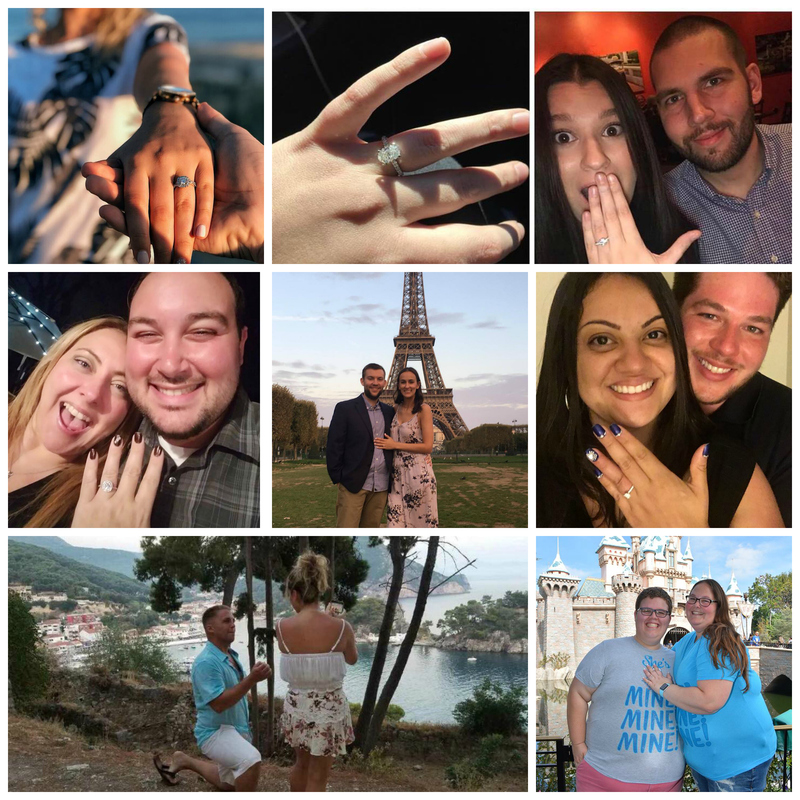 It has been so fun watching where an engagement ring takes our couples….literally, it’s been around the world. We’ve had the honor for nearly 30 years, to be the first stop in a marriage proposal. And we’ve seen where it goes. We’ve celebrated many baby’s births, anniversaries and birthdays with the couples that we’ve met and it has always been our privilege to be a part of their lives, really, we’ve felt like part of the family. 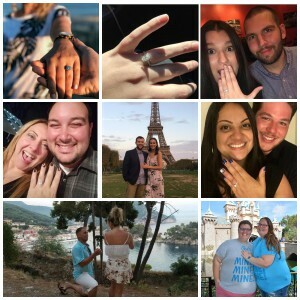 Roman Jewelers has been asking bridal customers to post their engagement photos and share them with us. Our hashtag has had a bit of a following and we are hoping it will grow. #RomanJewelersRomantic refers to our couples, their proposals, and we will continue to share more and more. Currently, plans are being made at the end of one year to celebrate them all and thank them for letting us be the first step on a wonderful and romantic adventure. Stay tuned. Roman Jeweler’s is perfectly located at the intersection of 5th Ave and Commons way. 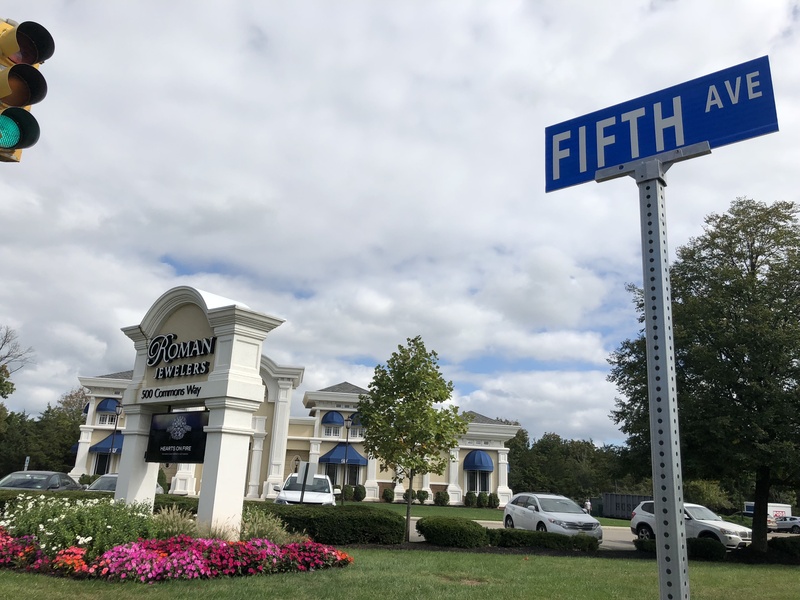 Roman Jewelers is located officially at 500 Commons Way, in Bridgewater, but last week a new sign went up on the corner that many customers and employees noticed right away. Serendipity? Roman Jewelers thinks so. Many, many years ago, store owners, Roman and Sophie, created an advertising campaign that let customers know that all the best of 5th Ave., in New York City could be found at Roman Jewelers in Central, NJ. It was true then and still holds true today. With jewelry brands known the world over like Mikimoto, Marco Bicego, Tacori, Hearts on Fire, Lagos, and the latest Fashion Brands like Freida Rothman, there is little need to fight the traffic and cross the river for designer brands found on 5th ave in NYC. Apparently an older, worn and tired sign was on the corner previously, but it was not noticeable. Now, with a new “5th Ave.” sign customers & employees are smiling, and Roman Jewelers would like to personally thank the person or department responsible for this fortunate circumstance…whoever they are. “I think we owe them a personal thank you and tour of the store,” said Lucy Zimmerman who owns the store along with her parents, Roman and Sophie. Until the mystery is solved, however, Roman Jewelers will continue to provide a little bit of 5th Avenue, right here in Bridgewater. February is a month that is all about love. From National Heart Month to Valentine’s Day, there are so many opportunities to show others how much we care for them. 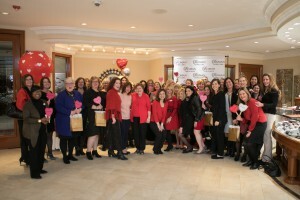 At Roman Jewelers, we felt it was a wonderful time of year to launch our Share Your Heart campaign. On Thursday, February 1, 2018, we invited over 40 local nonprofits to be a part of this special launch that was held at our Bridgewater location. Organizations from Hunterdon and Somerset Counties were introduced to the one-of-a-kind heart pendant that we specially designed to help support their fundraising efforts throughout the year. Do you remember the movie Forrest Gump? For those who do (and perhaps even those who have never seen it) you’ll recall Forrest’s iconic line: “Life is like a box of chocolates, you never know what you are going to get.” I like to think of this line every time I look at pearls, because the same concept applies to them—you never know what you’re going to get. Since pearls are created entirely by nature, they come in a variety of shapes and sizes. Similarly to opening a box of chocolates, when you open an oyster to find a pearl you never know what you’re going to get. Often, you’ll find a perfectly round pearl. But you’ll also sometimes find a totally irregular pearl—one that’s shaped unlike any other. These kinds of pearls are called Baroque pearls, and (in my opinion) are the most interesting type of pearl. I’m the first to admit that I’m a complete perfectionist. I look for precision in everything I do– in my everyday work, in the places that I visit, in nature, but most of all in jewelry. 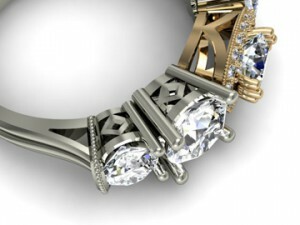 When it comes to jewelry design, I like clean lines and perfectly shaped jewels. But, interestingly enough, I am completely fascinated by imperfect Baroque pearls. Not only does their perfect imperfection look stunning in jewelry design, Baroque pearls also have a fascinating history and background. Let’s start with their name—baroque. Even the sound of the word evokes an image of something unique and extravagant. Where exactly does baroque come from? According to various dictionaries, the word originates either from French (where baroque means “irregular shape”) or the Portuguese word barroco (meaning “irregular pearl”). In English the word “baroque” points to a style in music, architecture, and the arts (known as the Baroque Period) that existed in Europe from the early 17th century to the late 18th century. The period was known for featuring many decorative parts and details in its artwork and architecture. The baroque style was filled with creativity, new art forms, embellishments, and adventure. These elements are also present in Baroque pearl jewelry, making its name very fitting. Today, the attraction of Baroque pearls lies in the very nature of their imperfection. The different shapes and sizes of baroque pearls makes them extremely intriguing and beautiful—not to mention unique—when put together. Baroque pearls allow for unleashed creativity and pure imagination in jewelry design. If you like jewelry that is unique and different, baroque pearl necklaces, rings, earrings, and bracelets are the choice for you! As with any pearls, the most valuable baroque pearls come from the South Sea and Tahiti. Lucky for designers and jewelry lovers, a high percentage of the pearls harvested in these areas are baroque. Akoya Pearls are the close cousins of South Sea and Tahitian pearls—similar in nature but smaller in size. 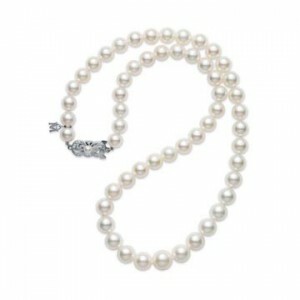 Akoya pearls are saltwater pearls, and the name “Akoya” comes from the oyster that produces them. That oyster is known as the “akoya oyster”and is found and farmed mainly in Japan and China. Akoya pearls are frequently white or cream in color, with overtone colors of rose, silver, or cream. The most valuable and cherished pearls are South Sea pearls. As the name implies, these pearls are found in the warm waters of the South Sea that surrounds Australia, Indonesia and the Philippines. These pearls are produced by the silver or golden lipped oyster, known as the Pinctada Maxima oyster. Both golden and white South Sea pearls are very rare. Exotic black pearls (which come from the black lipped pearl oyster) are called Tahitian pearls. Like the name suggests, these pearls come from Tahiti, but also several other French Polynesian islands. Though they are often referred to as black pearls, their color can actually vary from light creamy white, to gray, to green, to iridescent peacock, to deep black. Tahitian pearls come in so many different shades and colors that matching them into a finished strand is an enormous task. Quite often, a jeweler has to go through thousands of loose Tahitian pearls to create a single strand. Pearls can also come from freshwater lakes, rivers, and ponds. These pearls are logically called Freshwater Pearls. The majority of cultured freshwater pearls come from China, and (similar to Tahitian pearls) range in color from light shades like soft pink, lavender, peach, and white to dark shades like peacock and black. Even though pearls are intended by nature to be perfectly round, the fact that they sometimes turn out irregular only allows for creativity and distinctiveness in jewelry making. In the world of jewelry-making, where uniformity and perfection are often strived for, Baroque pearls offer a unique take that is beautiful in its own right. Even for someone like me, a perfectionist through and through, the individuality of Baroque pearls is highly appealing because it allows an appreciation for nature’s imperfections. But don’t let me sway you– what do you think? Do you prefer perfectly round or imperfectly baroque pearls? For more information on beautiful baroque pearls, or to inquire about purchasing your own pearl jewelry, make an appointment with Roman Jewelers today. 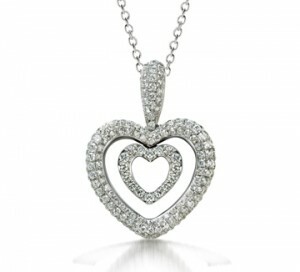 As Marilyn Monroe sang, diamonds (and really all fine jewelry) are a girl’s best friend. There’s no better feeling than getting a beautiful new diamond bracelet, or trying on a pair of birthstone earrings. Here are a few specific reasons why we love fine jewelry. 1. There’s something for every occasion. Whether you need something as simple as a gift for your niece’s birthday, or as elaborate as a necklace for your wedding day, there’s a piece of jewelry for you. Fine jewelry comes in a wide variety of styles, colors, and choices; because of this, there’s something that’s appropriate for every occasion, need, and price point. 2. It completes any outfit. I dare you to find a piece of clothing that doesn’t go well with a pair of simple diamond studs. A piece of fine jewelry adds the finishing touch to any look, making it complete. Not only are there certain universal pieces that go with almost anything (like simple diamond earrings or a strand of pearls), there is also jewelry to complement even the most complex of outfits. No matter what you’re wearing, jewelry is the cherry on top to your look. 3. It can reflect the wearer. Perhaps the best part about fine jewelry is that it shows off the style of its wearer. This is true for every piece a person wears: whether you’re donning a custom designed engagement ring or an Alex and Ani bangle, the jewelry you choose to buy and wear reflects you. 4. It can be as formal as you want it to be. Most pieces of fine jewelry can be dressed up or down however you want them to be. Pearl studs, for example, can be worn casually in day-to-day events, formally during one’s wedding, as part of your everyday business look, and everything in between. Fine jewelry is versatile in its wear. Whether you’re creating a completely new custom piece, renovating antique family jewelry, or merely getting your jew elry engraved, one of the most wonderful things about fine jewelry is its ability to be personally yours. Customizing a piece of fine jewelry makes it as unique as the person who wears it—and what could be better than that? 6. If it breaks, you can fix it. You know that old “you break it, you buy it” rule? This certainly doesn’t apply to fine jewelry. When a fine bracelet, necklace, or pair of earrings breaks, you don’t have to buy a completely new piece. 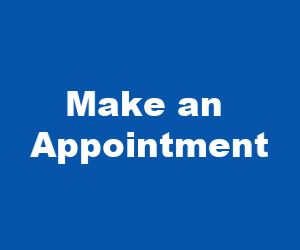 Instead, you can bring it into a jewelry repair shop to get it as good as new. 7. Each piece has a personal meaning and story. While this is especially true for custom designed pieces, every piece of fine jewelry has its own unique story of how and why it was purchased. Fine jewelry isn’t just jewelry, it’s a memory. In every culture, people wear jewelry. You don’t need to speak a certain language or know any particular customs to appreciate fine jewelry, no matter where it is from. You can even say that fine jewelry is the glue that binds the world together—it is an untouchable universal aspect of life. 9. It commemorates the special moments in life. Engagement rings, wedding bands, anniversary bands. What do these three items have in common? They all are celebrations of life’s most wonderful moments. Fine jewelry celebrates birthdays, engagements, unions, and more. A piece of jewelry is a memorial to the beautiful reason behind its purchase (whatever this reason may be). 10. It becomes a part of you. The jewelry you wear can become a part of your signature look. More than that, it can become a part of you. Jewelry that you wear regularly is there for every moment of your life, and you can start to even feel incomplete without it. With each wear, a piece of jewelry becomes less of an accessory and more of a part of the wearer. To inquire about getting a piece of your own fine jewelry, contact us at our Bridgewater or Flemington location. Contact information available here . When Andy and Christine were set up on a blind date back in September of 2012 it was less than ideal timing for the pair. Christine had just moved to New Jersey where she was starting a new job. Andy, on the other hand, had just moved out-of-state to Connecticut for a three-year medical residency. Thankfully, they both still accepted the set-up and enjoyed their first date at a local Somerville pizzeria. The pair hit it off immediately and that first date ended up being the very last ‘first’ date for them both. 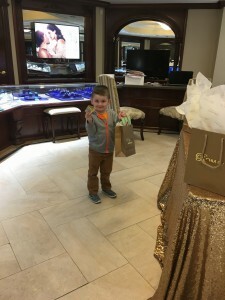 Roman Jewelers in Bridgewater & Flemington, NJ just made a donation to the Make-A-Wish foundation, New Jersey Chapter but with it, did much more. A recent Mother’s Day promotion went viral and allowed the Jeweler to donate $3,000 to the charity. In addition, it taught what co-owner, Sophie Shor calls, “A nice lesson on giving….not just to Mom, but to other children.” She hopes that it will inspire kids to continue their altruistic ways in the future.